On October 16th, one of us was running the 2012hoax twitter account when they noticed the twitter account 2012MythorFact churning out tweets at a rate of about two or three per minute. While browsing through that website, we were struck with a sense of déjà vu: We'd seen this content before. Some of the articles appeared to have been taken from the Yahoo! Answers website, with the article text being the question posted, and the answers being shown as "comments". For example, compare this screenshot from that blog with this screenshot from Yahoo! Answers. Another one of us pointed out that in fact the article at http://2012-myth-or-fact.com/?p=192 is a word for word copy of the article at http://www.articlesbase.com/news-and-society-articles/2012-end-of-the-world-1210985.html3. Other articles contained short blurbs about various products and services, along with a link. Invariably, when the article contained a link, it was to ClickBank. Clickbank is an company that facilitates transactions between "customers" — the people buying the product, "affiliates" — the people selling the product, and "vendors" — the people making the product. In other words, it is an electronic middleman. The #1 2012 Product On CB And The Internet. This Will Be The Most Talked About Topic Around The World For The Next 3 Years. High Search Volume, Cheap Traffic, High Conversions, Great Product, $33+ Per Sale *Huge Earning Potential*. 2012 Official Countdown To December 21, 2012. The link at the bottom of that post points to http://213245.dec212012.hop.clickbank.net/. 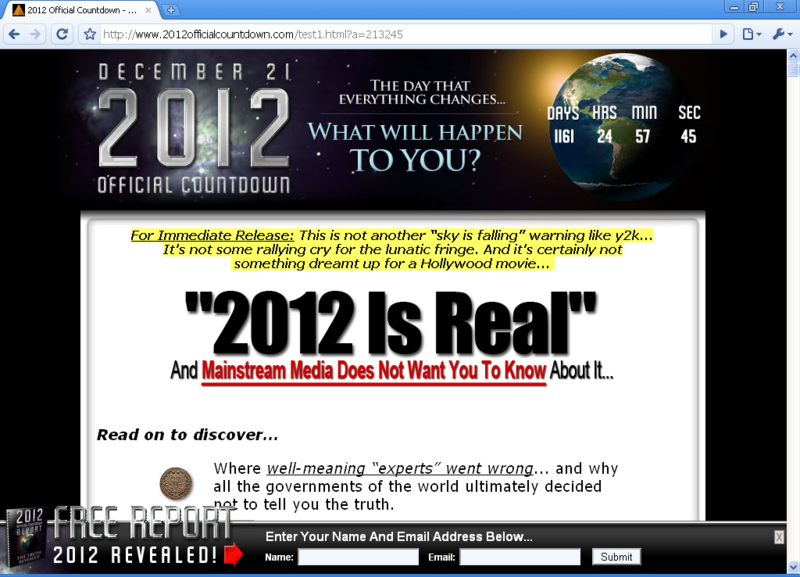 Clicking on that link takes you to http://www.2012officialcountdown.com/?a=213245 (screenshot to the right). Now this site we are very familiar with. It purports to be written by the most "respected internet scholar" that we've never heard of before, James Michael Sayer. 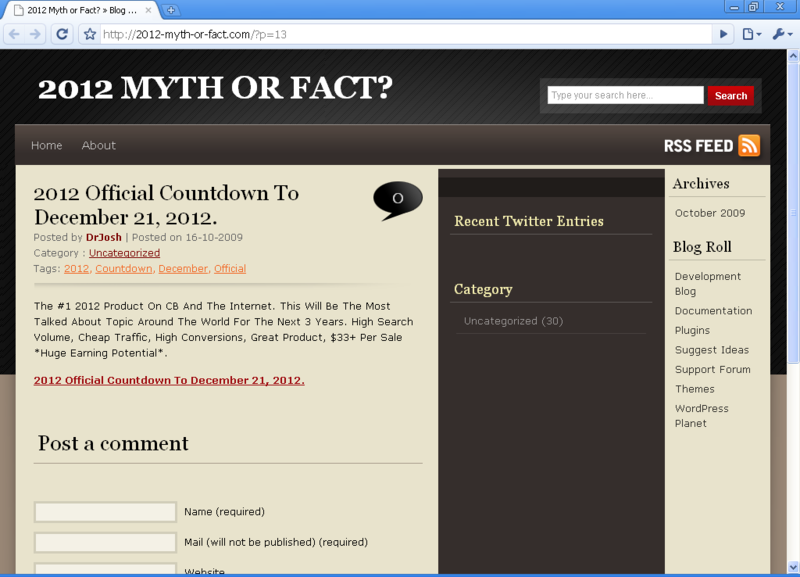 The Twitter account 2012mythorfact is spamming twitter, sending post after post linking to the blog at 2012-myth-or-fact.com. The blog is filled with either stolen content (including pages lifted from Yahoo! Answers) or articles that are being syndicated via RSS, or (and this is the majority of content on that website) articles that are actually ads taking you to a ClickBank affiliate. This also sheds quite a bit of light on the website "2012 Official Countdown", as it is now shown to be a complete scam, being advertised as a way to make money via Clickbank, giving the affiliate $33 per sale! This is just one example of the kind of misinformation you will find on the internet. Disreputable sites are stealing content from places like Yahoo! Answers in order to drive visitors, clicks, and revenue to their sites. 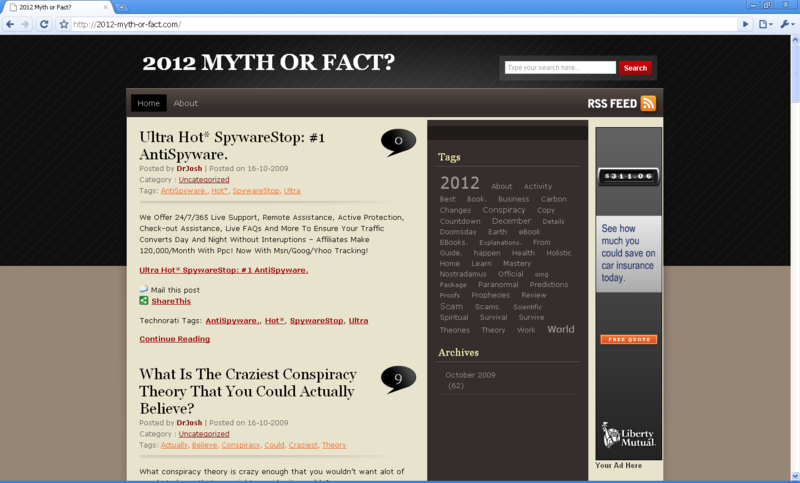 Another example is http://2012theendoftheworld.org/ which apparently also scrapes Yahoo! Answers content. Various Twitter accounts are posting numerous links back to a blog which promote the the idea of a doomsday in 2012. These sites do so in order to facilitate commercial sales of electronic 'guides' through various internet retailers. 1. We have deliberately not linked to that site, you will have to type the address in yourself if you are interested. 2. Link goes to a local screenshot. 4. This is a quote from ClickBank.com's "About" page. 5. A "tweet" is a single Twitter entry.